The Social Security Expansion Act, which Sanders first introduced in 2017, is also being introduced in the house by Representative Peter DeFazio. It would increase benefits for all recipients, with low-income seniors receiving a boost of nearly $1,300 a year. It would also make the annual cost of living adjustment more generous by shifting the formula to take into account health care and prescription drug costs, which rise faster than inflation. To pay for it, Sanders would subject all income above $250,000 to the existing 12.4% Social Security payroll tax, which is split between workers and employers. Currently, the payroll tax is only applied to wages up to $132,900. Plus, the senator would levy a new 6.2% tax on single people with investment income above $200,000 and couples above $250,000. This extra revenue would extend the health of Social Security by 52 years, according to Sanders' office. 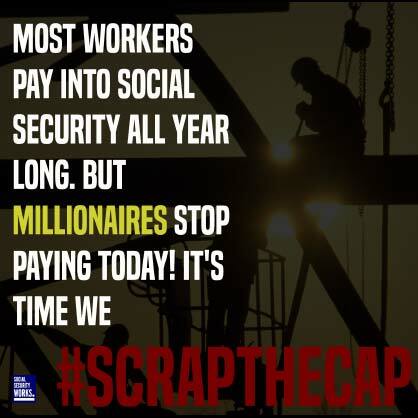 Let's keep in mind that a high earner has their social security benefits capped as well. Proportionally, they earn less benefits.